We believe that the Sitka Fanatic Jacket is the best bow hunting jacket. It’s fitted feel, heat trapping features and innovative design will keep you warm and dry. It’s taken decades, certainly man years longer than it should have, but now we hunters finally have it. The perfect bow hunting jacket for whitetails is here and it comes with features that make your hunt much easier and more comfortable. Sitka has long been setting the standard for high-quality back country and mountain hunting clothing and they are now bringing their innovation and quality garments to deer hunters. We have the Sitka Fanatic jacket for bow hunting this fall and it’s going to be a piece of equipment in my hunting closet for a long time. 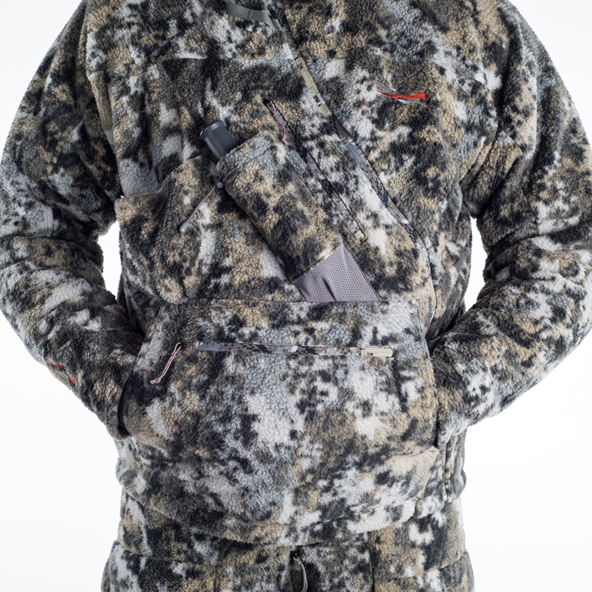 Sitka’s Fanatic Jacket was designed to be the ultimate jacket for bow hunters so that they can not only easily access their most important tools while on stand, but they can stay warm and still have a light weight setup that allows for easily drawing a bow. Built with a Berber fleece outer shell, the Sitka Fanatic Jacket is very quiet and warm and has GORE WINDSTOPPER inside the fleece. Primaloft Silver Insulation is against your body to trap heat and the power of silver is incredible for keeping you warm in any temperature. 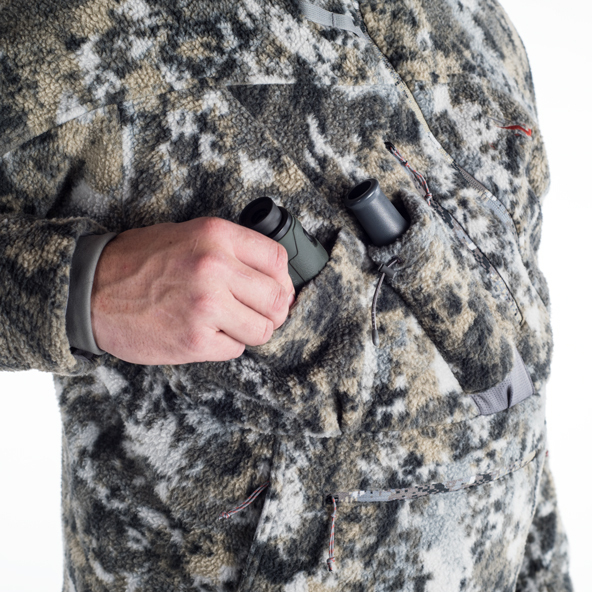 With a magnetic closure pocket that is deadly quiet for your range finder and a kangaroo pocket to keep your hands warm, the Fanatic jacket is incredible for bow hunters. The first thing that you’ll notice about the jacket is that the zipper is on the side of you and twists up towards the top. This is so that you can have a kangaroo pocket in the from that allows hunters to solve a problem that’s been plaguing them for decades: How to keep your hands warm with little or no gloves on while on stand. Simply unzip the pocket sides put your hands in and toss in a heat warmer and it’s a built in muff for your fingers. This is the absolute best part of the jacket and I can’t believe it took this long for someone to make this! Wind is sealed out and on the front you’ll find a magnetic closure pocket for your rangefinder, a safety harness pass through port to easily allow you to have the ultimate concealment and safety and gasketed cuffs. If the Sitka Fanatic Jacket couldn’t get any better, it does by being water repellent and offering you the best range of motion of any hunting jacket that I have ever worn. You get what you pay for when it comes to camouflage hunting clothing and Sitka is one of the best. This is by far the best jacket that I’ve seen and the Element II camo pattern is top-notch for disguising you in a tree when the leaves are tough to find. To purchase your Sitka Fanatic Jacket check out Sitka’s website and buy one here. They make products for all hunting and outdoor adventures and if you’re tough on clothing and equipment, this brand will stand up to the abuse. Don’t miss the latest hunting gear reviews and outdoor news from us here at MorningMoss.